I have recently blogged about windows 8.1 search history and how searched terms/phrases are recorded as LNK files in a post here. 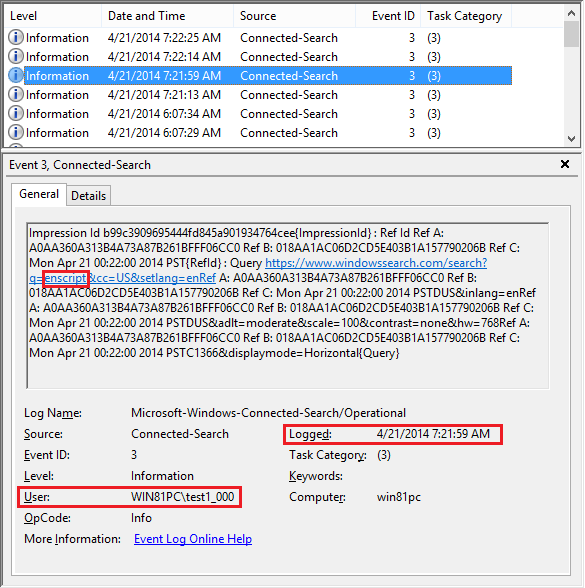 But windows also logs searched terms (search history) to the event log and web history (and cache). Below is a screenshot for one such log entry. Windows logs all URLs and reference links here. Windows, by default tries to search for everything online as well as on the machine. Even if you are offline, a search URL for online searches is generated and seen here. The screenshot below shows the same search run when machine was offline (not connected to internet). The best way to study this data would be by parsing this database either manually (using libesedb and lots of data formatting with additional parsing!) or use a free program like IE10 History reader (or an expensive brand forensic tool). However, if you are just interested in the search terms without dates or other information, a raw search into the datebase files will suffice. 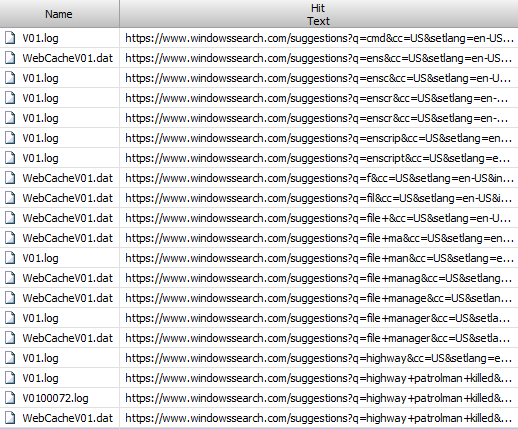 The screenshot below shows hits when searching the IE web cache files for the above URL using Encase. 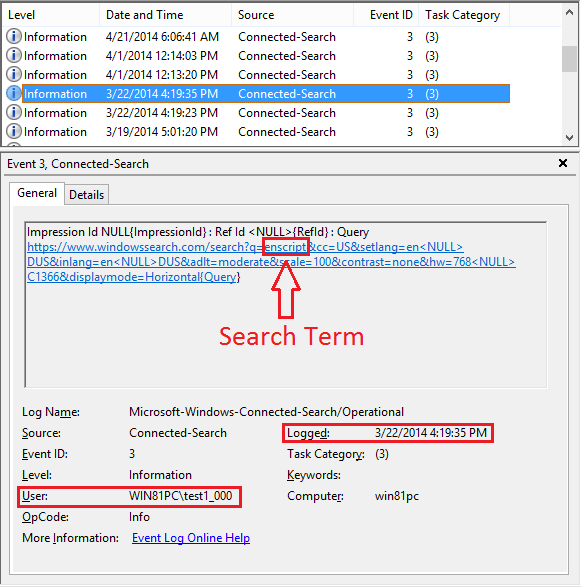 An aspect missing from LNK files and the event logs is the search suggestions and interim search results. As Rob Lee hinted to me earlier that a user could search for a term (without hitting Enter or the search button after entering the term in the search box), but not click on any results and none of the above artifacts would be created. Windows uses the 'search as you type' feature and terms windows guessed for you (as you were typing into the search box) or interim search results are discarded. However you would find some traces of the terms as windows will make online queries for the 'search as you type' feature. If this is not clear, just recall how you search with google. As you begin typing the letters of your keyword into the search box, google automatically suggests most popular searches beginning with those letters. Windows also does the same thing. Actually, these are not the suggestions, but the lookups for term/phrase entered into the search box. The data returned (query response) will contain the suggestions. Below is a screenshot showing the webcacheV01.dat file (and supporting db files) with search hits as displayed in Encase. Thus there are multiple locations (connected search LNK files, event logs, web cache) where an investigator can find evidence of searches run by a user. Each has its uses and caveats.